The Techy Coach Blog: Digital Badges Part 1: If you aren't using Badges...Maybe you should! Digital Badges Part 1: If you aren't using Badges...Maybe you should! Recently while putting together some online classes for District Professional Development, I decided to reward teacher attendance with Digital Badges. I had thought about doing this on several occasions in the past, but had never gotten the process off the ground. While face to face attendance to PD workshops was somewhat steady, it was not exactly as high as I had wanted it to be. Knowing that availability of time is finite, and that teachers have many responsibilities after school, I thought an online course here and there might help them get the training they needed, when it was convenient for them. 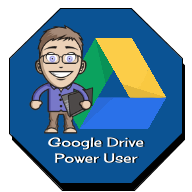 So I created one class on Google Classroom to start with, and created a Badge in Google Drawings as a reward for participating. After the first teacher had earned their badge, I decided to create a Leader Board for the district, showing how many badges had been earned at each site. I posted the first badge, announcing that we had 1 school in the lead and that they were winning. I never expected what happened next! After posting this, I had 25 enrollments come through by email. That competitive spirit that resides in some of us came to a head when the "We have a winner!" email went out. Since then, we have had a great deal of activity online. Nevertheless, I thought I would share my process for setting up classes and rewarding badges. For this series, I'll start with the creation of the badges themselves. It is a simple process that I've explained in this video. I hope you like it.